I’ll be honest: I don’t spend much time on keeping my freelance business afloat and organized. You know how they (but who’s they?) say to spend time on your business, not in it? 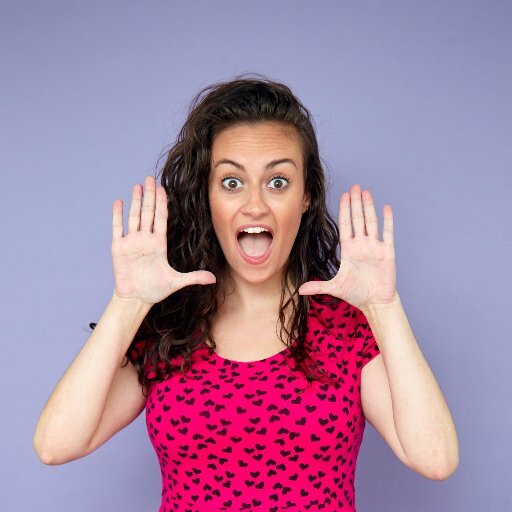 All of the solopreneurs, freelancers, and remote workers in the Work Brighter community want to streamline business processes as much as possible, but the freelancers don’t really have any other choice. 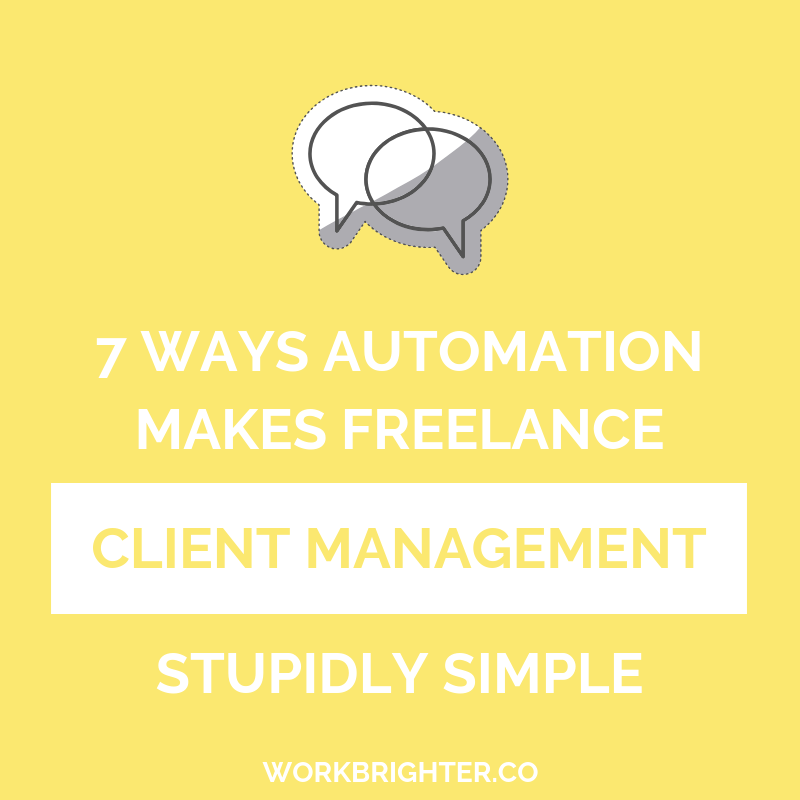 Admin and client management stuff isn’t billable work, whether you’re billing per hour, per project, or per hairs pulled out in frustration over a difficult task. So to succeed with your services, ya can’t let it take over. Back-and-forth emails, progress reports, onboarding emails – that stuff’s not what your clients are paying you for. So it’s not in their best interest to take up all your time with it, either. They’ll be happy to do their part to let you focus on your work for them, if you frame it that way. So from lead generation through to day-to-day client communication, here are a few different ways to add workflow automation into the mix at every step of the client management process to save time and frustration for errybody. Do you have one blanket “contact me”/”hire me” form on your website? Do you then get vague, generic inquiries that require you to spend lotsa time on research and back-and-forth emails? You’re making things sooo much harder for yourself. The biggest benefit of automation is that while it may take time upfront, it only takes time upfront. Put some work in now to create multiple, specific contact forms on your freelance website. It eliminates a ton of the back-and-forth question asking that comes with learning about a new prospect or client. Your contact forms should ask all the questions you need to know for the specific package someone’s interested in. You’ll get everything you need right away, instead of having to Google the prospective client or hop on a call right away. Another handy thing is that all the good form builders hook up to IFTTT and Zapier, so this first step in getting a new client can kick off a bunch of other automated steps. Take advantage of contact form and survey form integrations with things like CRM & sales software, email marketing providers, and templates. This question is specifically tailored towards writing clients, and is designed to tell me whether or not this is a ghostwriting project. It’s a big factor in my rates and something a lot of prospects forget to mention, so this question makes sure I get that info before we start talking deets. Just like with initial outreach, forms can make that first client communication easier. For example, do you have a set of questions you ask each prospect or new client? Put ’em in a survey. Guidelines about your “office hours” and other things clients need to know? Create a cheat sheet or YouTube video to send them. No need for ~yet another~ Skype call before the Skype call before the Skype call. This form mentioned in #1, for example, also kicks of an automated confirmation email which includes information and links based on whether or not it’s a bylined piece. Especially when my freelancing was my side hustle and I wasn’t available during the same hours as my clients, this helps them get what they need from you and wanna work with you more quickly. Besides all the back-and-forth involved in a new client, there’s also a whole lotta other admin to take care of. It kind of ruins the fun and rush of winning a new deal, doesn’t it? But things like adding a new client to your CRM and financial softwares, customizing quotes, putting together contracts – soooo much of that client management can be automated. With a trigger as simple as adding an email to a certain folder or creating a new entry in your CRM, you can set up a chain reaction of activities in different apps that take care of everything for you. I have my Dubsado CRM, Acuity scheduling tool, and all apps related to my freelance client work hooked up to IFTTT and Zapier. This super duuuuper cuts down on how much time I have to spend on “virtual paperwork” involved in new deals, so I can celebrate the win and then get to work. Once you and a new client have both said “leggo,” there’s obviously even more “paperwork” (I feel weird calling it that when it’s digital) before you actually start billing them for stuff. For example, you might have sent them a quote or sample contract during the lead nurturing stages earlier. But you likely will have final tweaks to make, contracts to finalize, and stuff like that. While you obviously can’t create a 100% custom contract from an IFTTT recipe, you can cut down on the amount of customization to do yourself. For example, take integrating your contracts and CRM. Your contract software could automatically pull in data and contact information from the CRM deals. You can just hop in to double check that info and add anything that’s missing. So we’ve talked preparing yourself for new work. We’ve talked about preparing your business systems for new clients. Now let’s talk about preparing that client. Onboarding can take work. I’m pretty sure that as a freelance writer, I have it pretty easy. I couldn’t imagine doing the amount of briefing I’ve heard and seen happens with more complicated long-term projects like VA work and design or development. The best tip for managing it all? Processize it all as much as you can (trademarking “processize it,” btw, it’s so much better than “systemize”). Put as much information as you can figure out how to into tools, apps, etc. This makes it easier for both you and your client to go through everything needed to get started. You can spend time on something else instead of going through the same list of procedures for the billionth time. They can familiarize themselves with that same info on their own time by accessing your onboarding tools. A really great example is the many onboarding Trello boards out there published as examples. In fact, it’s how I was onboarded as a new full-time hire at Mention back in the day, as well. You could easily adapt this for freelance clients by creating different lists for things like tool access, your contact information and guidelines, processes and timelines, etc. In fact, I’ve adapted it for you! Click here to download a freelance client onboarding board template to copy to your own account and send off to clients! Very few clients trust a freelancer enough to have them just go off and do their own thing, incommunicado immediately. Sure, your relationship may build up to that, but a lot of new clients want update while you earn their trust. Unfortunately, that can be pretty task-heavy. With a newer client, you probably want to check in more often, letting them know what you’re getting done and getting approval for things before moving forward. But those quick updates can quickly turn into sending them either several emails a week, or sending them goddamn novels as your weekly updates. Reduce time spent sending emails about what’s been done and what hasn’t by using project management software. Something like Trello, Asana, or Basecamp lets you update clients by simply checking off a task or moving a card to the “in progress” or “done” column. Simply make sure they turn on email notifications. Freelancing is kind of cyclical, right? Whether you’re doing one-off projects or recurring work or retainers, there’s a bit of a pattern. For example, a contract renewal automation can connect to a specific contact type in your CRM. You could automatically send monthly retainer bills and create tasks in your to-do list to follow-up if they’re not paid within the specified timeframe. Hell, you could even automate that follow-up, too! You can also automate tasks in your to-do list, assigning tasks to your client in your project management tool, sending documents and emails, etc. Automating things is best for both you and your client. If nothing else can convince you to get on board, that client thing should. 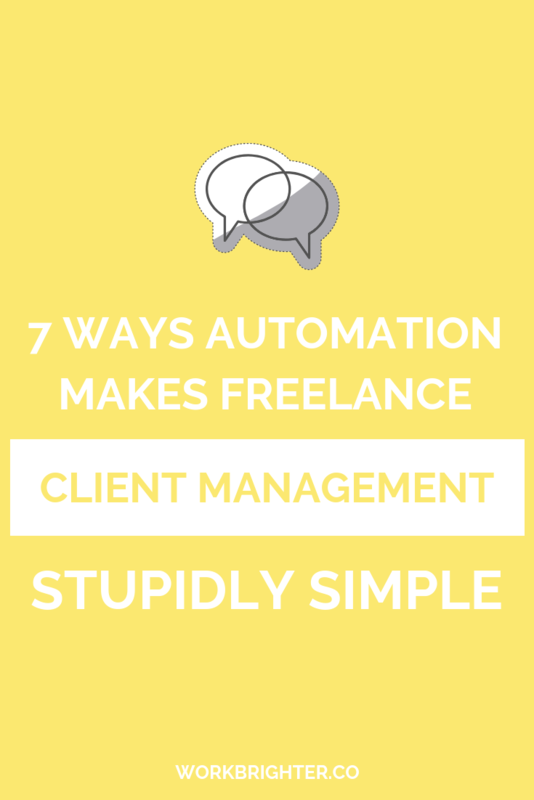 💁🏻 Automation makes you a better freelancer to your clients. It frees up your time and your focus to spend more of it on them. It makes their relationship with you more organized, and they always know what to do next because you have systems that make it clear for them. And it frees up time for them, too. So start embracing it, y’all, this needs to happen!